If you’re reading this you are probably pretty au fait with the internet. You’ve managed to navigate your way to this blog, at least. You may even have arrived here via a Google search. Can you imagine how different life is for someone who has never performed a Google search, who has never watched a Youtube video, or has never sent a text message. One of the first things I heard after waking this morning was someone on the radio talking about “Google, Facebook, and those kinds of services which have become integral to all our lives”. Yesterday I spent a couple of hours with people for whom that is not true in any way. So, yesterday I ran my second Connected Christmas Party. It was at Lower Edge Day Centre in Rastrick, West Yorkshire, and it could not have happened without the support of Calderdale Council’s Adults’ Health and Social Care Commissioning Service, and in particular Elaine James and Stacey Leonard. And, I was very grateful for the support of Paul Webster who was able to join us for most of the session. And it was a lot of fun, after some initial scepticism and nervousness, participants were soon happily chatting about their favourite music, how their families use technology, and places they used to live, including Huddersfield, Rotherham, Ireland and Australia, which we could then search for on Google Earth and Street View. And the selection of favourite music which people requested included Billy Fury, Dusty Springfield, Mario Lanza, Roy Orbison, and The Beatles, yet again there was no demand for Vera Lynn! As we were leaving the Centre, Diana the Manager, asked how it had gone and was very pleased to receive positive feedback. “That’s really good”, she said, “because a few of them were quite reluctant to come along in the first place”. That’s because they had been told they were coming along to learn about the internet. When they arrived and found out that that it was about fun, communication, memories, and music, their attitudes radically changed. This is why I advocate that Digital Inclusion must not be about classes and courses, it has to be about patient and empathetic exploration of people’s interests and needs, and careful matching of content and services online which can meet those needs and stimulate those interests. So, I’ll be going back next week to help people explore their interests further, and hopefully to introduce some new people to the joys of the internet at the same time. Ultimately, I do this because I believe that technology can break down older people’s social isolation, and that excluding them from the online world is a real detriment to their health and wellbeing. 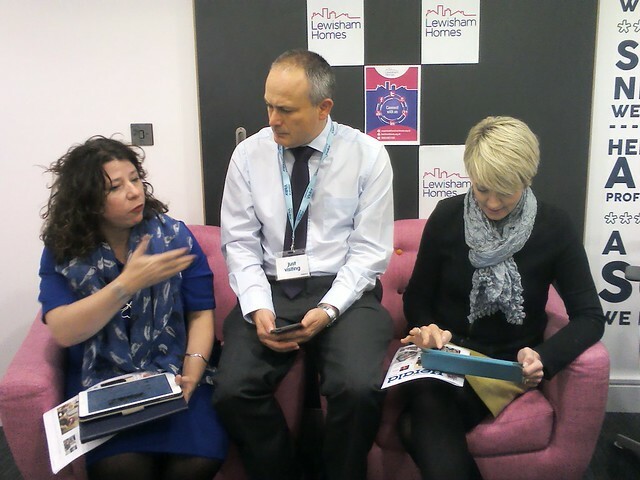 One really interesting aspect of the conversation was the talk about how people’s families use technology. I believe older people get further isolated because the younger members of their families communicate with each other online, and then exclude those who are not seen to be tech savvy. I hope that what Connected Christmas and similar events can do, is to seek to plug older citizens into the online networks their families are part of and thus ensure they can receive care, attention, and support from those who they care about but who are not immediately close at hand. The session also highlighted a pressing need for health and social care professionals to be trained to act as Digital Mentors. A topic to which I will be returning again soon. Thanks again to Calderdale Council for making this possible. Please get in touch if you’d like me to run events like this for the people you work with. This kind of approach works. We need to spread it widely.